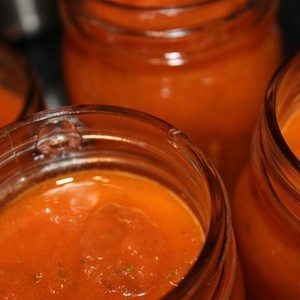 This tomato sauce recipe benefits nutritionally from the addition of homemade bone broth. Makes 2 quarts pureed sauce. Heat a large, heavy-bottom pot over medium heat, and add the oil, onion, and garlic. Sauté about 8 minutes until the onion is translucent. Add the chopped tomatoes, parsley, wine, broth, marjoram, and rosemary. Bring everything to a gentle simmer and cook, uncovered, for about 4 hours. It will reduce quite a bit. At the end of the cooking time, add 1 teaspoon of the sea salt and pinch of sugar. Add the remaining salt if desired. *Homemade chicken broth recipe here and here.